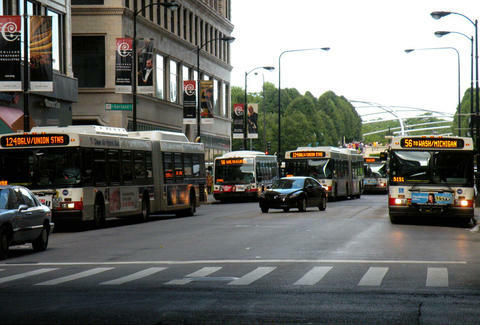 Finally, you might not have to endure as many miserable commutes with buses bunching up along your bus route, thanks to a new system the CTA said it hopes will address the awful, frustrating issue. ​Under the new, nearly $9 million system, the CTA control center will have a real-time communications link with every driver and will be able to track the location and progress of each bus. As a result, the agency said buses will be able to more quickly adapt to traffic conditions and ultimately avoid buses piling up in bunches along routes, and most importantly, reduce the long waits between buses. Specifically, the control center will be able to more precisely monitor how buses are spread out by tracking speed changes and even alert drivers to better adhere to schedules, according to the CTA. In other words, the CTA is bringing its bus communications system into the 21st Century. The new system is already installed on about 80% of the CTA's 1,800 buses, and while the agency doesn't expect it to solve the issue of bus-bunching outright (in your dreams! ), officials said it will be better than relying on a fleet of "street supervisors" who drive around looking for service problems, according to a report by the Chicago Tribune. While it's likely impossible to completely prevent buses bunching up because of unpredictable traffic issues, hopefully the improvements will lead to actual increases in reliability across the bus system, which saw an 8% decrease in ridership in 2014. The good news, though, is that the CTA said it has already seen a 40% decrease in those maddeningly-long gaps between buses during a trial period of the new system on nine of the busiest South Side bus routes this year. Tony Merevick is Cities News Editor at Thrillist and does not miss taking the 3 or 4 buses up and down Michigan Avenue every day. Send news tips to news@thrillist.com and follow him on Twitter @tonymerevick.